Ananka's Diary: Is THIS the Most Famous Fake of All Time? 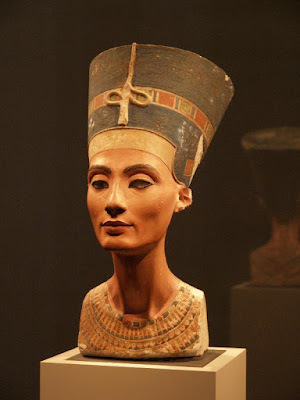 According to a Swiss art historian, the iconic bust of Queen Nefertiti (shown above) may be nothing but a modern fake! Henri Stierlin's latest book claims that in 1912, a German archaeologist asked an artist to create the bust. The poor man never intended to perpetrate a hoax--he merely wanted to test some ancient pigments he'd uncovered at a dig. But when the work was praised by a German prince, the archaeologist couldn't bring himself to embarrass his guest by exposing the bust as a fake. As a result, Nefertiti ended up in a Berlin museum alongside a plaque that gave her age as 3,400 years old. This is an astounding theory! The bust only recently underwent a series of scientific tests, which supposedly found a more "realistic" portrait of the queen hidden beneath the glamorous plaster exterior. Whoa, that sounds pretty disappointing for all those people who thought Nefertiti's bust was real. wow, she was really pretty, i feel bad for the dude. but how did that prince not realize? even when i first saw it i thought: wow really shiny! " hey Brave Chicken why are you online at 1:23 AM? wow that up late! Brave Chicken was doing what all of us normal people do at 1:23 AM: Scaling tall buildings, hunting for Megalania by flashlight, or perfecting ninja skillz, etc. Wait, but has it been proven as a fake? Or is that just a theory? I sent this artical in before. did you get my comment??? Anon: The blog is on New York time, so if Brave Chicken was in California or something, then it would be some other time. Hey brave chickens, you must be havin lotsa fun perfecting ninja skills at 1:23 AM! by the way, i can't believe everyone thought it was real all this time. 8D THAT IS SOOOOO COOL!!! Anonymous: You did send me the article. I'm so sorry I didn't thank you! I hope you'll accept my thanks now. Very, very interesting! Hmm.... I am in doubt. There are also tons of theories regarding shakespeare, that possibly he didn't write those plays but a nobleman did. There are many reasons why someone of high esteem might want to have someone else say they wrote it, one reason being that playwriting wasn't considered very proper. There are many different candidates for the true shakespeare. :) Of course, you never really know. And it doesn't really matter. Oh my! I was going through old posts+comments, and I'm being questioned of being awake at 1.23 am? (geez, what a cool time, eh?). liltomboyblue: I've heard those theories about Shakespeare too. Wouldn't a time machine be fun? Then we could find out ALL the truths.